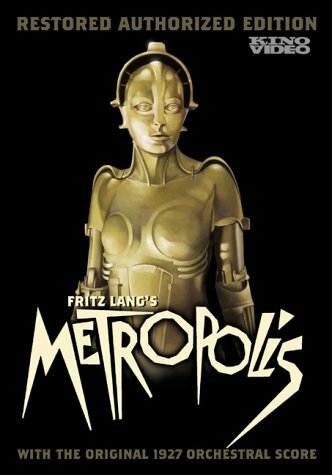 I wasn’t sure what to expect when I rented Metropolis. I’d heard of it before and thought that it sounded OK, but it is a silent film and I thought that maybe it would be slow paced and, well... boring. I was completely wrong. I really liked this movie! Oh sure, it featured actors that generally ran around in fast motion and used the most over-the-top facial expressions and body motions to show their feelings—overacting in it’s most pure manifestation—but somehow in the context of no sound it made perfect sense. To do otherwise would have been too subtle. I can also see why few silent film stars went on to be stars in movies with sound—it’s a whole different kind of acting. On of the bad things about this movie is that roughly 1/4 of it doesn’t exist any more. The people who restored the film for the DVD tried to work around this by putting up sections pulled from the screen-play, but it was jarring in many places, as whole sub-plots had been lost. Apparently (according to the special features) the original film was released in Germany and when it was translated to English for the American release, the translator cut out the 1/4 of the film that is now missing. After showing for a short period of time in Germany, the film was pulled and redistributed with a German cut similar to the edited American version. And apparently no one saved the original. Why? The movie bombed when it was released in 1927. Then, later, it was rediscovered and achieved a sort of revival during the 1980s. It depressed me very much that so much of the movie seems lost forever because the part that was there impressed me so greatly. This movie is kind of strange sort of retro / science-fiction / oppressed-working-class type of movie featuring a mad scientist, a pacifist and her evil twin robot (no joke!). Even the special effects were decent—there were no flying hubcaps suspended from strings in this movie. I was entertained the whole time, and I definitely recommend seeing this movie.